I know some people who don’t like egg yolks. I just don’t get that. Egg yolks are the best part! I mean, I like egg whites too, but I would never just eat the whites and leave the yolk. But my friends, it’s the truth. There are some crazy people out there — I know, I’ve seen them. Back in university I had this one prof that would always dim the lights. I would inevitably fall asleep no matter how many coffees I had. I’d try to devise ways to stay awake, but my method of choice, crunchy snacks, were a bit too noisy in the silence of the lecture hall. One day, I heard the tell-tale rustle of a ziplock bag, and my sleepy self was instantly awake. Someone was snacking?! The noisemaker in question was a tiny, tiny girl in a giant hoodie. Her snack of choice: a huge ziplock bag of pre-peeled boiled eggs. I was feeling a teeny bit envious, but when I realized what she was doing, my envy turned to horror. Yup, you’ve got it. She was eating the whites and tossing the yolks aside. She wasn’t even putting them in a ziplock for later. She just peeled off the whites, ate them and crushed the yolks in a paper towel. She ate six eggs like this, with me completely awake and gawking, until I couldn’t watch anymore. I have no idea how many egg yolks died that day without fulfilling their life purpose, but I was sad. Yolks are the best parts of eggs. Truly. 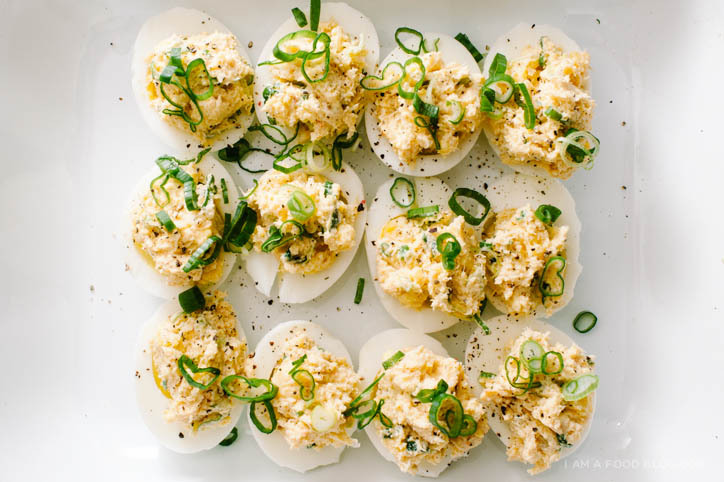 Just like the filling of these deviled eggs are the best part. The whites are merely an awesomely portable, edible bowl for the filling. 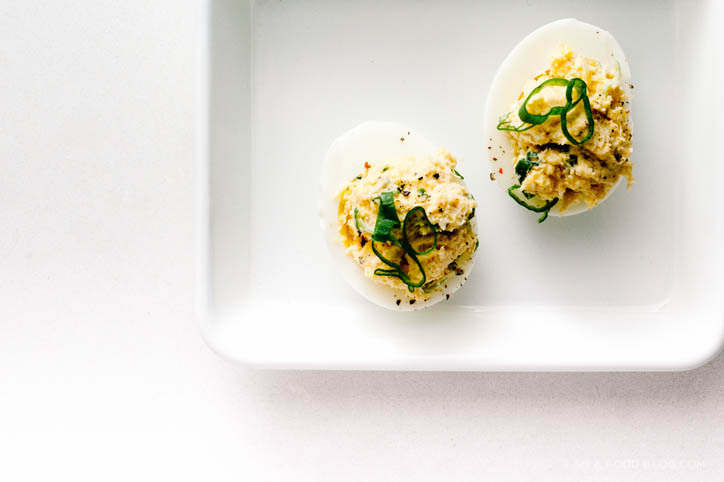 If you like crab rangoon, you’re going to love these eggs. They’re just as tasty, without any of that deep-fried nonsense. (Who am I kidding. I love deep-fried). If you’re a mayo hater, you can just use a wee bit more cream cheese to bind up the filling. I can eat plain egg boiled eggs like there’s no tomorrow, but these eggs are even better. I love food mashups. I like deviled eggs and I like crab rangoon. Behold: The Crab Rangoon Deviled Egg! All about mayo, all about yolks, all about this recipe. 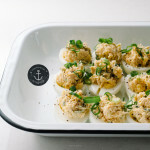 I keep seeing deviled eggs show up in restaurants too – they are making a comeback! I just saw this Food & Wine tip on how to peel an egg with a spoon! I haven’t given it a try yet, though. Eileen, I think you’re totally right, overcooked yolks just aren’t that tasty…but I do love fancying up! 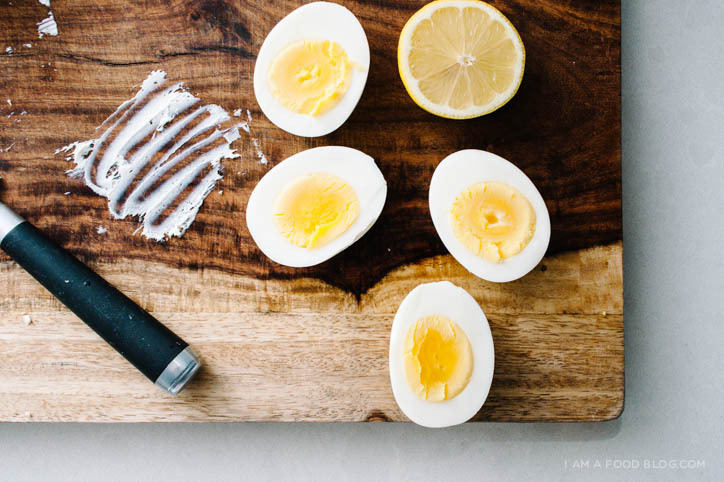 You landed the yolks PERFECTLY in the center of your perfectly-cooked boiled eggs, you rock star! I love it. I agree that the yolks are the heavenly part of any egg, eggs, the most perfect food in the world. 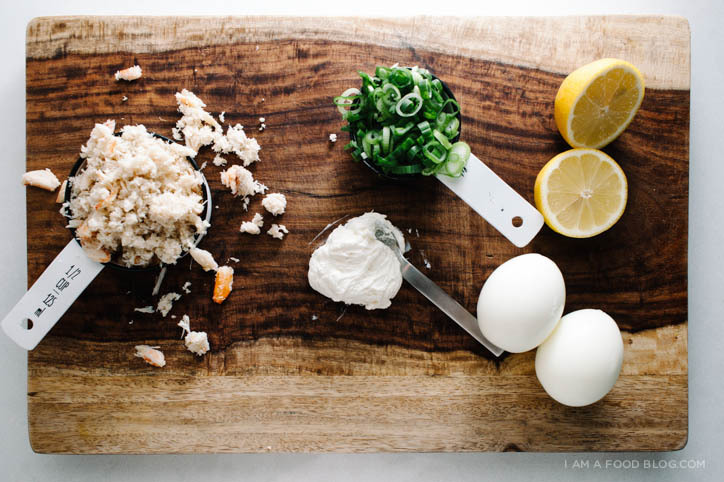 Especially sunny-side up, I mean — what would that be on fried rice without the yolk?! And why does everyone in the world (esp the fitness world) think that eating fat equals being fat? We need those yolks yo. I love you for this, the flavors are wonderful. Can’t wait to try! I used to be one of those yolk-discarding weirdos, but I’ve (thankfully) matured. 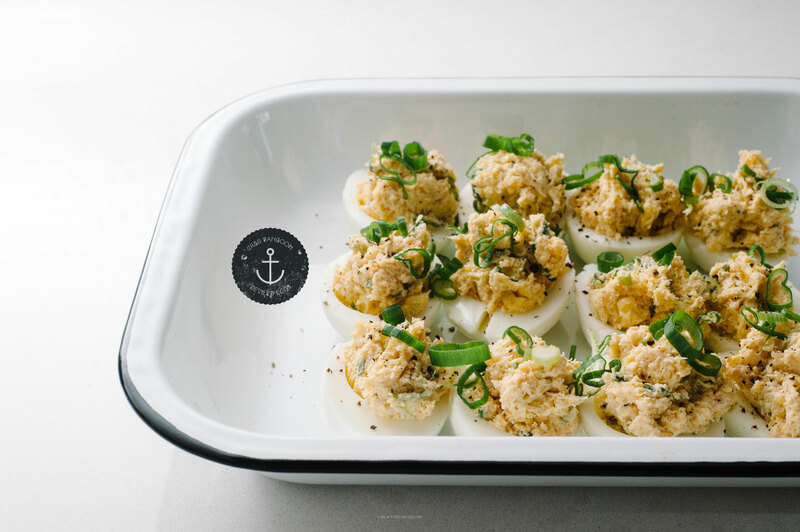 You have me craving hard boiled eggs, crab rangoons, and these deviled eggs! I used to dislike so many good things too, the strangest being mustard. Now I love it though, so there is always hope for those mustard/yolk hating folk! OMG. Drool. Why do you do this to me!? Yum! I love your story about the lecture hall. I was following along, thinking “yum, I hope she brought soy sauce or salt n pepper, and some to share!” and instantly recoiled when I read she was eating only the whites. Talk about wasteful, and just plain silly. These look incredible and I am currently drooling at my desk. Who woulda thought? Thanks for the amazing idea…definitely making these next week! Yummy! I can’t grasp the concept of hating egg yolks either…blasphemy! Um, WOW. this looks INCREDIBLE!!!! RIP all those egg yolks… :( My boyfriend throws away yolks too, it makes me insane. So much waste! But I bet even he would eat whole eggs if they looked as good as this. I love the yolks too and can’t get over being out for breakfast with someone who orders an egg white omelette – throw those yolks on mine then! Gorgeous recipe, and so happy to have found your stunning blog! i’ve never liked the yolks, but it also never crossed my mind to just…. not eat them. i guess this makes me simple. deviled eggs are a horse of a different color though…. so satisfying! there are never enough! +crab! +mayo! word. I saw your blog and I loved. I know you poo-pooed the fried aspect, but to amp up the concept of crab rangoon, one could fry some wonton wrappers, cut in small strips and garnish the eggs with them. Yeah? What kind of crab did you use? I know it is out of a can but did you go all-in for the jumbo lump or something else. I’m thinking jumbo lump is not really needed here, and maybe claw meat would be just fine. Man these look great…just found your blog btw. Linked to it from the Saveur article about your win. I think i’m going to spend the next few days in your archives, don’t mind me. Jay, I LOVE deep-fried deliciousness, so I would never poo-poo at deep fried wonton wrappers! I was just looking for a down and dirty way of getting that crab rangoon flavour. I used claw meat, but if you wanted to be all fancy and go for jumbo lump, it would be mega delicious for sure! Hei steph, I really love your blog, it’s very clean, simple, nice and so inspire. I love your crab rangoon recipe and I tried a different one, it’s classic Cheese Deviled Eggs also, but it wasn’t perfect like what I expected, especially when I cut the eggs..Lol, but still good. I’m one of those weird yolk haters, unless they are mixed with stuff in deviled eggs. I’m always looking for interesting deviled egg recipes, and I made these the other day along with your California roll nachos. They were both amazing! you’re absolutely right, fresh crab would be awesome in these!